Worms in dogs - signs,symptoms,prevention. Worms in dogs are not something you really want to talk about, but the thought of worms living inside your dog is so unpleasant and the fact they can have a serious effect on your dachshunds health will encourage you to learn more about them. roundworms,tapeworms, whipworms and hookworms are the worms you are most likely to encounter with your dachshund dog. Main sources of infection are directly from the mother while still in the womb, from the mother’s milk, eating infected poop, contacting eggs or larvae in dirt or on grass or eating untreated offal. Worms in young puppies can cause serious illness. Diarrhea or vomiting (you may find round worms – looks like spaghetti or tape worms – looks like grains of rice) in the vomit or poop. Roundworms in dogs live in the intestines but can migrate through the body and cause damage to the lungs. They are white or light brown and can be up to 10cm long. These worms are a major problem in puppies so it is advisable to worm puppies at about 2 weeks old. Humans can also be affected by roundworms. As dog poop or contaminated soil a major source of contamination it is advisable to keep your dog toilet area clean and not allow children to play in the area. Make sure you wear gloves and wash hands when dealing cleaning up poop or dealing with the dog toilet area. Tapeworms get their name from the fact that they are long and divided into segments and act as egg sacs these drop off when passed out with dog faeces these segments look like rice when appearing in poop. There are several different types of tapeworms in dogs that can infect your dachshund, each with a different in between (intermediate) host which is how the dog gets infected. Hydatids, (Taenia and Echinococcus) tapeworm, have as there intermediate host small rodents, like mice, rats, rabbits or larger animals like sheep or deer. 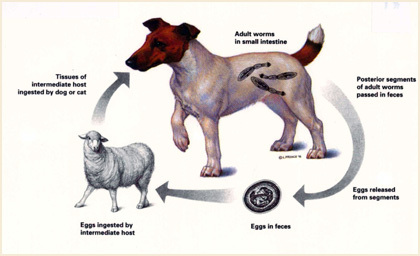 The worm larvae develop cysts in the major organs of the host animal especially the liver, when dogs eat raw offal then poop out the eggs, the sheep or mice eat the eggs and the cycle starts all over. The dogs are not really seriously affected by the eggs except maybe to not grow to full potential and to suffer with an itchy bottom. Humans eating these eggs will also have problems with cysts growing on organs these can cause serious problems if the cysts burst causing peritonitis or other complications an operation may be required to remove the cysts. Dipylidium caninum is another type of tape worm,it uses fleas as the intermediate host and is the most common. The dog poops out the eggs and the sheep or rat eats the eggs and the cycle keeps going. This type of infestation is not so dangerous and usually causes little problems other than an itchy bottom. Humans can also be infected if they swallow an egg but it is not a major problem like Hydatids. A good flea control program will stop the tape worm completing its life cycle. Hookworms are internal parasites that live in the digestive system of your dachshund. Larvae of hookworms live in the soil, your dog can become infected simply by contact or penetration of the skin or dogs eating larvae in soil when they lick themselves. Hook worms have sharp teeth that penetrate the wall of the intestine and cause internal bleeding. 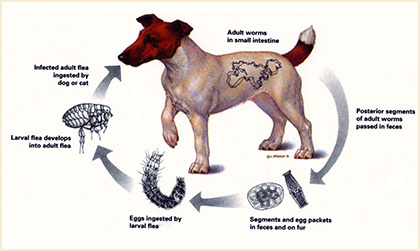 Prevention is similar to other intestinal parasites, keep the area dogs live in clean and keep dogs away from infected areas. Hookworm infection is high in young puppies, so a regular treatment program is necessary. 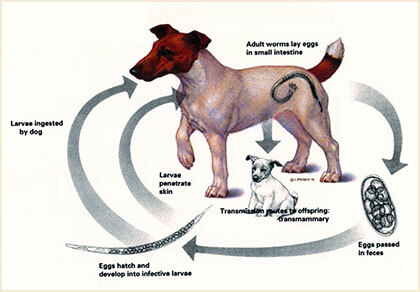 Symptoms of hookworm infestation are dull coat, poor appetite, weight loss, anaemia. Blood can sometimes be seen in dog’s diarrhea. Humans can also be infected by hookworm's usually through the skin. 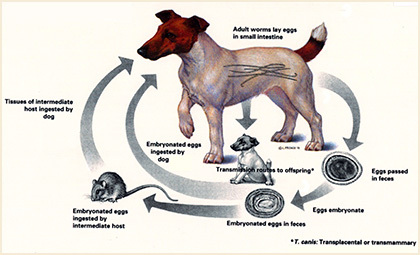 Whipworms can live in the environment for up to 5 years; your dog is mainly infected by eating whipworm eggs found in soil or substances that have had contact with infected dog poop. Light infestations are not a problem but heavy infections will cause diarrhea and anaemia and require treatment to stop any complications. Again the best prevention is keeping your dog’s toilet area free of poop and ensuring regular vet checks and ensuring your dog has a regular worm control program. 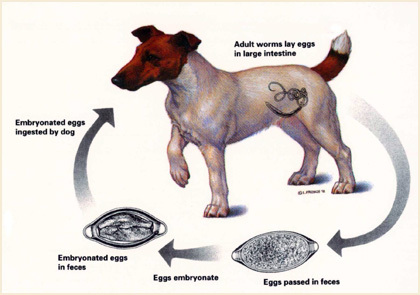 In the early stages of intestinal worm infection your dog may not show any symptoms it is important to have your dog tested regularly by your vet as they will prescribe safe and efficient products that treat and control worms in dogs. Another serious issue with worms in dogs is with heart worms, you need to maintain an active heart worm program to prevent serious problems. Save on your pet's medications at 1-800-PetMeds. They guarantee the lowest prices on Frontline, Heartgard, Advantage, and all your pet's health care needs. Free shipping on orders over $39. Return from worms in dogs to home page.